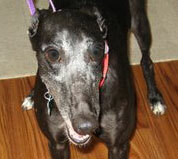 FOSTER UPDATE: Rio is a confident, healthy female greyhound that fears nothing. She loves to be with her foster guardians and follows them around the home. Rio is slowly adjusting to living with a cat but when her fosters are absent from the home, or it’s time for bed, Rio is crated as a safety precaution for Kitty. Rio barks very little and is house trained without access to a doggie door; her fosters are home most of the time. She loves her walks, does not pull on the leash, is an enthusiastic car passenger, has a healthy appetite and no problems have been observed with any particular foods or treats. Rio graciously accepts grooming, knows her name and several basic commands: ‘go outside and potty’ ‘lay down’ ‘come’ and ‘leave it.’ Rio is a cuddle bug that loves to play with toys and give kisses. She is ready for adoption.